... is to make the world a better place. This is the aim on which we have been working hard since 2012. We love the nature and try to change the society in a positive way. That's why we support the protection of environment and handmade crafts. We always want to exceed the expectations of our customers. We are more than just an online store – we are a community which consists of thousands of satisfied customers and fans. The nature is and always will be our utmost priority. It is our long-term commitment to both protect the nature and enable other people to join our efforts. Therefore we are seeking for eco products created through sustainable processes, supporting projects which focus on the nature protection, and regularly informing our customers about the beauties of nature. We also recycle at work :-). Our T-shirts are certified by the Oeko-Tex 100 (which proves that they are harmless to health). The T-shirts are printed with organic water-based colours which ensure that their printing looks incredibly realistic and will last for a long time. The colours are applied directly to the T-shirt's cotton fibres. 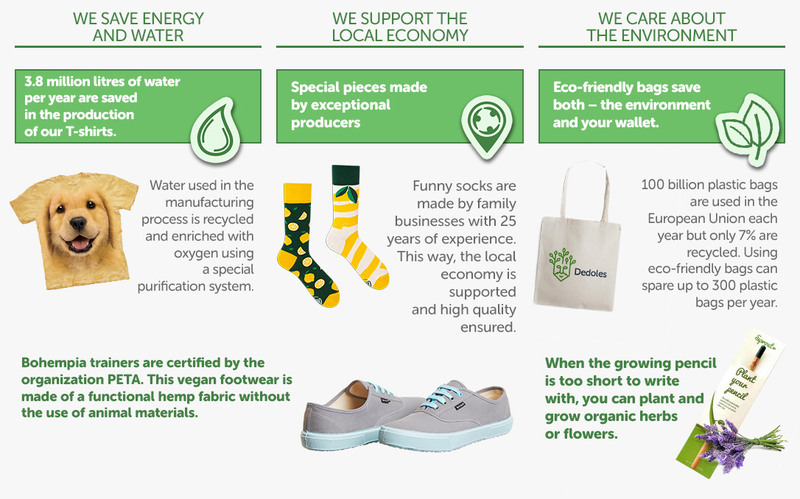 We offer also other ecological products – our candles are made of soya, socks made from bamboo and soaps, which are made of herbs, do not contain preservatives. Our pencils can grow and eco bags could spare thousands of plastic bags. One of our main goals for 2016 is to extend the collaboration with local manufacturers and craftsmen. High-quality products are not only environmentally-friendly but also increasingly popular among customers. David has been creating the survival bracelets since he was 17 years old. We were captivated by his skills and persistence. Despite his handicap, he continues to improve his products. He is brimming with honesty and kindness, and we are honoured to work with him and make possible for him to develop his talent. Survival bracelets are already worn by hundreds of our customers. Watch David's story. Thanks to the cooperation with VLK (WOLF – the Forest Protection Movement) we created T-shirts made of bio cotton. This way we have spread the awareness about the organisation's activities among our customers and fans. Part of the profit from selling bio cotton T-shirts went to the above-mentioned movement which protects Slovak forests. Rippovci from the town Marianka supply the handmade natural soaps with which our customers immediately fell in love, and they become a Christmas hit. The cooperation is still quite short, but yet very intensive. In the last two months we have pleased you with approximately 1500 pieces of soaps. This proves that the collaboration with local craftsmen makes sense. We sell on 4 markets therefore we are also able to offer their products to people abroad. We are here for a generation of people who care both about the quality of their clothing and the future of our planet. Are you one of them? Give yourself a present. 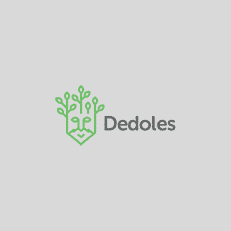 Find a Dedoles T-shirt which characterize you and put on a piece of nature.